Black Nylon Pan Head Screw. 100 Per Box. License Plate Nuts And Bolts. Universal 100 Per Box. License Plate Nylon Inserts. 100 Per Box. 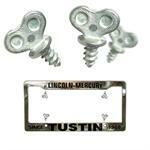 License Plate Pan Head Self Tapping Screws. 100 Per Box. Metric, Phillips Pan Head Machine Screw. For Foreign Cars. 100 Per Box. 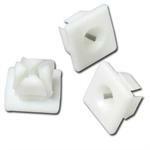 Hex Head Self Tapping, License Plate Screws 14 X 3/4" 100 Per Box. License Plate Screws For American Cars. 100 Per Box. License Plate Screw. #2136 Pan Head Machine Screw. 100 Per Box. Metric,. Thumb Screws. Used For Dealer License Plates. M6 X 16mm 25 Per Box. License Plate Thumb Screws. 50 Per Box. Long Metric License Plate Screws. Used for Foreign Cars. 100 To a Box.